I recently read two books by Jennifer L. Holm and they were both wonderful, but in two different ways! First, I finally dug into Penny From Heaven which I should have read long ago, but just never got to it. This Newbery Honor book was a gem. I am a sucker for books about Italian Americans since I am married to one, but I didn't even know this was going to be about an Italian American family, so that was an added surprise! The story takes place during the 1950's in New Jersey (I believe). Penny Falucci, the 11 year old main character, lives with her widowed mother and maternal grandparents. Her father's large Italian family also lives in the town. 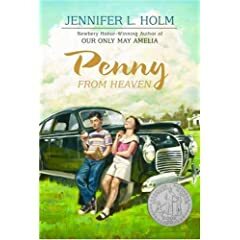 The novel follows Penny in her quest to find the truth behind her father's death as she deals with life as a tween and her mother's new relationship with the milkman. I felt so close to Penny in the story. Even though it is another time and a completely different life than I lived, I related to her Italian family through what I have learned from my own husband's family. Holm was right on! She got the nuances of Italian American life so right, I found myself laughing out loud. (Especially at Nonny, Penny's Italian grandmother.) What I was so disappointed in was myself! I did not know enough about what Italian Americans went through during World War II and post-war. Now I plan to look further into this topic, as I am so interested. This book is great for fifth grade. I am and will continue to recommend it to students in my class. It is awesome that it recently came out in paperback making it reasonable to add to my class library. In my recommendation I let students know if they like humorous books that may make them cry, this is the book for them. Of course they are all interested. 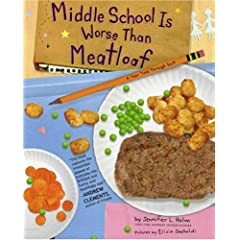 The second book by Jennifer Holm that I read was Meatloaf is Worse Than Middle School: A Year Told Through Stuff. I mean seriously, how can one author write two books that are SO DIFFERENT and nail them both? Although this book does have a plot and storyline, it is hard to retell or summarize. But the book is exactly what it says it is- "A Year Told Through Stuff." The story shows itself on the face of notes to friends, lists, grade cards, post cards, even bank statements. This makes the book very easy to read and kept me completely entertained. Although the main character, Ginny is in the seventh grade, I think any student fifth grade to seventh or eighth grade could relate to the book. The story gives my fifth graders a good look at what they are up against getting ready to go to middle school. I know I shouldn't compare two books in this way, but I told my students if the are looking for something that is similar to Diary of a Wimpy Kid with a girl main character, this book would probably appeal to them. I hope that is not a bad analysis, but having read them both, I think I am on target with that statement. This just proves authors can be so diverse. I know Jennifer is also the author of the popular Babymouse series. I haven't read any of those yet, but I surely plan to now.